The perfect swimsuit in wet look HOT PINK or TURQUOISE. 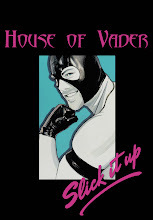 Pick one up at SLICK IT UP now at a discount using coupon code "houseofvader"
Hey David, I was gonna grab the pink swimsuit and the New York neon/black t-shirt but I don't see it listed on the site. Did you guys discontinue it? The New York Neon Shirt was LIMITED EDITION! When I say that, I mean it!! I don't just say buy it now cause there aren't gonna be anymore as a sales trick!! :) We sold out and now its done :( The new neon tanks are pretty awesome though!